I am soon posting two new videos sharing our adventures in the Holy Land. I don’t do this for the fun of it but to help others understand, love and enjoy the land of God through video. WHY DO I POST THESE VIDEO ADVENTURES? There is a need for people to know the the Bible and the Catholic faith are not a myth — like saying, “Once upon a time in a land far away in the land of fairies and elves…” NO, the Bible and the Catholic Church are ROOTED IN HISTORY. I can take you to the places where it all happened. We can walk in the footprints of God. We can smell what Jesus smelled, see what he saw. We can see the tombs of the patriarchs, apostles and saints. What we believe is verifiable in space and time, in history and science. So, below I have added two more adventures. First, my hike through the Wadi Qelt from Jericho toward Jerusalem. It is the wilderness where Jesus was tempted by the Devil, the paths he walked between Jerusalem and Jericho, and the wilderness where early hermits lived in caves AND still do! You can imagine walking with Jesus through the wilderness. Second, Janet and I went to Hebron to see the hometown of Abraham, Isaac and Jacob. It is also the place where Jesus was first made the king. We also visited the Jewish settlement and prayed at the tombs of Jesse and Ruth. We then went into the Machpelah which is the tomb of the patriarchs (Abraham, Isaac and Jacob) and the matriarchs (Sarah, Rebecca and Leah). This tomb is divided into two ends: one a Muslim mosque and the other a Jewish synagogue. Talk about tense! Today was celebrated as the birthday of Mohammed and we went into the mosque first (you’ll find the video very interesting) and then into the synagogue. Finally we went to the Oaks of Mamre where Abraham lived. Here he was visited by the Trinity (Genesis 18) before they sent down fire on Sodom. Here is an ancient oak tree claimed to be the oak that Abraham sat under. We got acorns from the great-great grandchildren oaks which are growing nearby today. Jericho video below; Hebron video will be added above soon. We have a number of pilgrimages to the Holy Land BUT LOOK — we have others too! 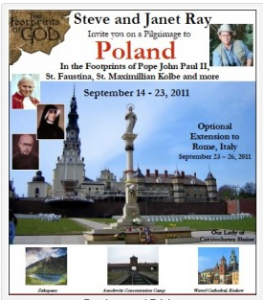 In September we are going to Poland to follow the footprints of Pope John Paul II, Saint Faustina and St. Maximilian Kolbe among others. We will see this beautiful country, celebrate Mass in breathtaking churches, eat their delicious food, meet local Catholics and even visit Auschwitz. In November join us in Italy to follow the footprints of the Fathers of the Church from MIlan, to Pavia (St. Augustine), to Ravenna, then to Assisi and finally Rome. This trip is sponsored by Dr. Scott Hahn’s St. Paul Center and I will be joined by Dr. Matthew Bunson and Mike Aquilina. This will be an exciting trip through gorgeous Italy with its thousands of years of history, delicious food and wine. We have a very small and intimate group going to the Holy Land in April during Lent to prepare for Easter. We have reduced pricing for this trip. Join this group with excellent weather, Fr. Rob Clemens from Phoenix and me as your guide. Dr. Scott Hahn asked me to lead his group in May-June! This will be a remarkable trip with both of us teaching along the way and seminars in the evenings with Mike Aquilina teaching as well. We have no shortage of pilgrimages. See them all at www.FootprintsOfGod.com. 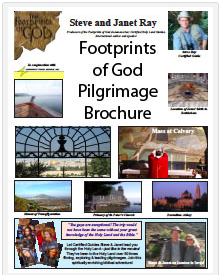 We are planning many more for 2012 and 2013 including trips to Ireland, a Marian trip to Lourdes and Fatima (and more), to Catholic England and even a trip to Germany and Rome to study Martin Luther, John Calvin and “Reformation” history — and the truth of the Catholic Faith. Why travel to the Holy Land with us instead of the many other groups that are going? All pilgrimages are NOT created equal. View the video below to see why!